Welcome everyone to an exciting new series, looking at how some of our favourite sewing bloggers curate their handmade wardrobes. From vintage chic to clean modern shapes, how do these seamstresses create and communicate their own unique style in their projects? What and who inspires them, from film and music to everyday life. And what’s their dream outfit? You have a very unique style. 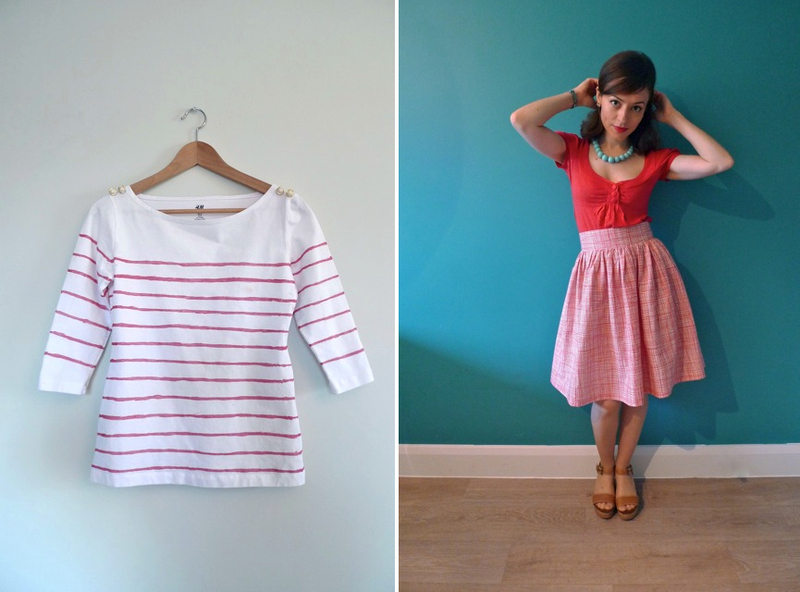 A little preppy, a little vintage, but very classic and dare I say… quite Gallic? Would you agree or have I summed you up all wrong?! Right on the money! I would use all those words in describing my style. 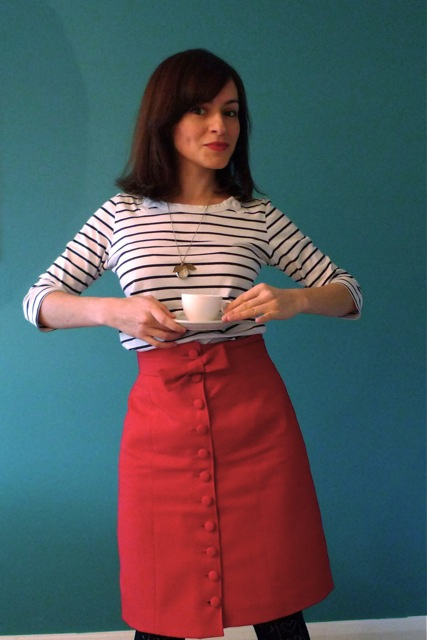 I love Breton tops, neckscarves, red and navy blue, full skirts, pencil skirts, capri pants, beads, buttons and bows. The Gallic influence stems from a year I spent living, studying and working in Paris. Not that many French women dress like that, but I resolved to channel the classic Brit-abroad-pretending-she’s-French look! I work in and have studied film – my greatest source of inspiration is 1960s movies, mainly French, but also Italian and American. Godard, Varda, Resnais, Antonioni movies… endless sources of inspiration. 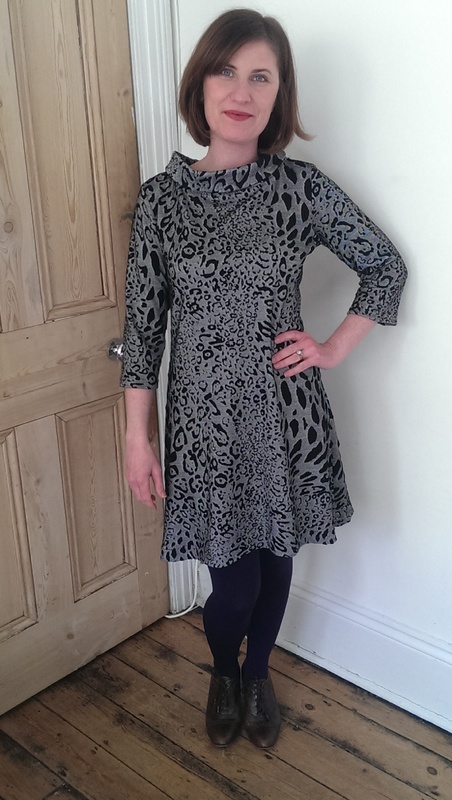 I’m not sure if my style preferences are always obvious in the clothes I sew, as I often get so overexcited by the possibilities that sewing opens up and use it as a chance to experiment. But I’m trying to get better at making things that are “me”. 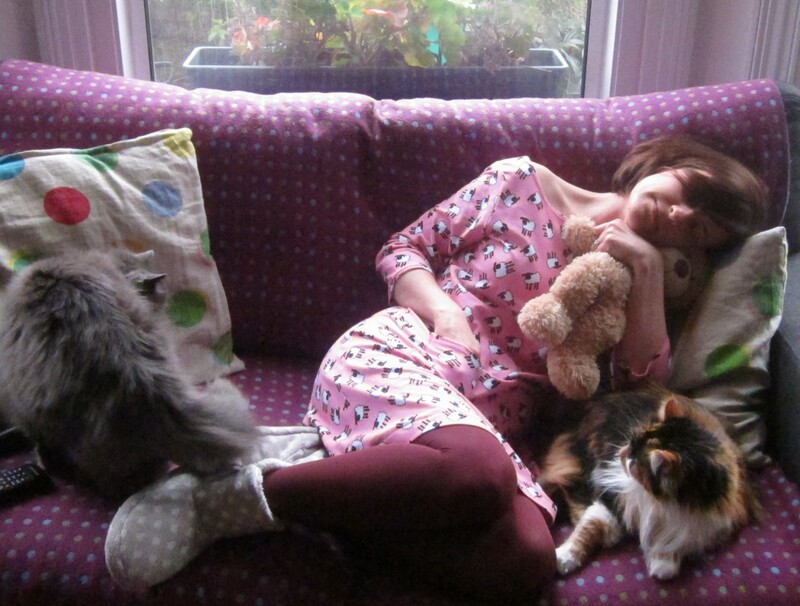 My style mantra is “What would Anna Karina wear?” Or when I remember, at least! It’s a total cliché but I also love Audrey Hepburn’s style. Both have a great sense of silhouette, are chic yet playful, cute but a little uptight… in a good way. As much as I’ve always loved clothes and design, I’m not really into fashion so don’t follow the catwalks or read magazines or anything. For me, sewing is a way of expressing my love of clothes without relying on fashion designers to tell me what to wear. Having said that, I can’t deny that designers haven’t influenced my style. I adore the Dior new look, Chanel classics make me swoon, and occasionally I discover a designer that I get obsessed with, such as Lena Hoschek. If you had to select one self-stitched garment that really encapsulates your style, what would it be and why? Hmm… good question! Maybe my Dazzlingly Red Beignet. It’s red, it has lots of fabric covered buttons, it has a bow belt. It’s casual and chic at the same time. And it looks great with Breton tops! When I first started sewing I used to experiment a lot more but I’m trying to stick to my “signature style” these days. 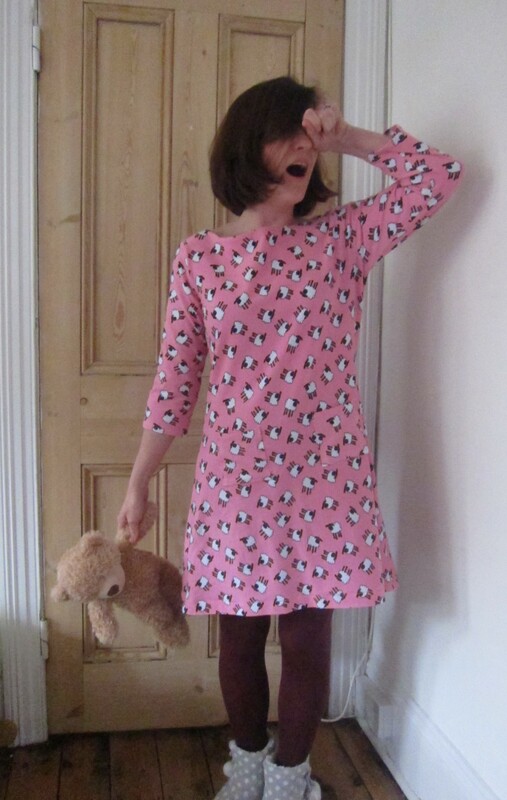 What has worked is 1970s style clothing – I’m surprised by how into it I’ve got in the last few years (see for example my 1970s Feel Beignet and 1970s Summer Dress). What hasn’t worked so well is full-skirted 1950s style dresses like the ones out of Douglas Sirk movies – they swamp my small frame and don’t quite suit my lifestyle! I still wear full skirts but I shorten them to the top of my knee and wear them more casually with tops. Lots of things! If I were taller I would wear high waisted flared trousers a lot more. And if I had slim, tanned thighs and dainty knees I would wear 1940s tap pants and playsuits! One of the many wonderful things about sewing is being able to create your own individual style (you’ve really hit the nail on the head with this new series). 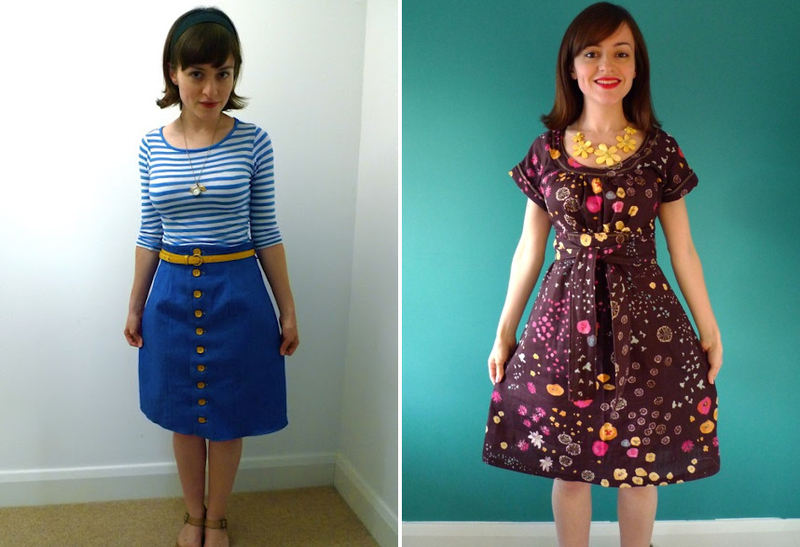 So there are LOADS of sewing bloggers I could mention, as individual style is what they do best. There’s Zoe’s nautical chic, Nette’s dainty style, Marie’s ladylike makes, Jane’s gingham and polka dots, Angie’s cotton dresses… Ooh I’m really looking forward to reading these posts! Let me know what you think about the new series and if you have any fantastic nominees for My Handmade Style, let me know!